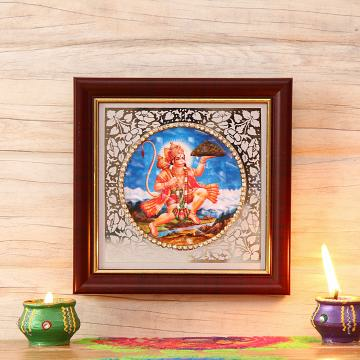 Auspicious Wooden Framed of Lord Hanuman ji 6"
Auspicious Wooden Framed of Lord Hanuman for your living or puja room. Buy Auspicious Wooden Framed of Lord Hanuman ji 6", sold & shipped by IGP where you can shop online for Exclusive Collecton of Indian Handicrafts, Festival Items & Ethnic Gifts. This Home Decor collection has been tagged as USDWUA0064, home decor, gift set, indian handicraft, idols figurine deity, murti, hindu religion.